Professionals and others have been using leather briefcases for more than a hundred years. The durability of leather ensures a well-made briefcase will last a very long time and, in fact, gain an attractive patina with age. Vintage leather briefcases available in today's market, and in good enough condition to be used daily, are not usually older than about 30 years. Prior to shopping, buyers should consider size, quality, interior design, use, and color. By establishing preferences, customers can narrow down their selection to vintage leather briefcases that suit them best. Consider how much stuff is actually going into the bag. Storage capacity, in terms of weight, is vital. Lawyers, for example, typically carry more papers and documents than a software engineer, so they will need a large briefcase. If the bag is used to carry a laptop and office supplies, consider a larger one. When buying vintage, it's always important to check for quality. If buying at a brick-and-mortar store, check the stitching to make sure there are no loose threads. Examine the edges for any splitting. If buying online, check product reviews, prices, and seller feedback. Also, note that full-grain and top-grain leathers are the sturdiest, while corrected leather is a less expensive option. Is the interior organized in a desirable way? Are there enough pockets, dividers, pen slots, and compartments inside? Consider everything that could possibly be put into the briefcase, and choose one that can efficiently hold all those things. Will it be used when working at a bank's headquarters? Will it be carried to a laid-back office? Will it be brought to an art studio? Considering where the briefcase will be used is crucial to deciding whether to get a professional, casual, or trendy bag. This is all about personal preference, but the color should blend well with the buyer's outerwear - coat, hat, shoes and boots. Common options include black, navy blue, and brown. Options for vintage leather briefcases are numerous, and shoppers should find one that suits their needs. A professional who travels a lot has different needs than someone who works at the same cubicle each day. Attachés are hard-sided, box-style cases. Vintage attaché leather cases are typically reinforced and are considered durable, professional, and great for storage. These cases protect work documents very effectively because of the sturdy, two-hinged frame design. These messenger-style bags have a flap and buckle closing. These vintage leather briefcases are liked for their portability, sophistication, and durability. While not typically as sturdy as attaché cases, flapover briefcases offer flexibility. Note that many have a shoulder strap, so be aware that carrying a lot of weight each day can cause neck, shoulder, or back soreness. Best for those on the go, portfolio cases made of vintage leather are popular for their elegance and portability. A portfolio is a handle-less case, while a folio is a portfolio with a retractable handle. While they don't have large storage capacities, they efficiently organize work papers and personal items. Shoppers who travel a lot should consider a vintage leather briefcase with wheels. A wheeled briefcase functions as a traditional briefcase in everyday use but can convert to a suitcase for travel. If you have a lot of accessories, search for a briefcase with many interior dividers, slots, and pockets. If a computer will be put into the briefcase, be sure to calculate that into the size needed. Search for briefcases with specific slots for laptops. When purchasing a messenger bag, make certain it has a strap that wraps around the chest, especially if the bag is used to carry a lot. This helps disperse the weight of the briefcase and makes it less stressful on the body. Once buyers have an idea of what kind of vintage leather briefcase suits their lifestyles, they can search eBay. After going to the Fashion section, click on the Men's department. Go to Accessories and click on Backpacks, Bags, and Briefcases. 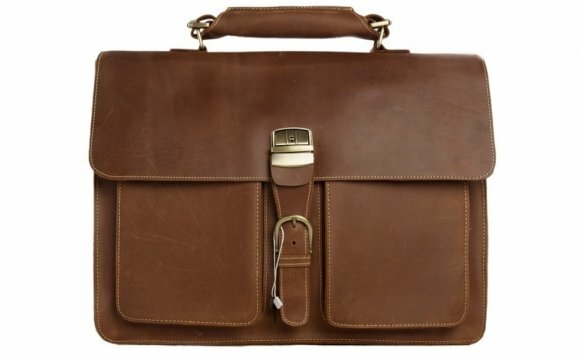 From there, use the search bar and type in "vintage leather briefcase." By tailoring searches and checking product reviews, sellers' ratings, prices, and product descriptions, shoppers can ensure they buy a quality piece of vintage leather. Buying vintage means taking extra care to ensure that your briefcase was not too heavily used. Don't be afraid to request more photos from the seller; inspecting and confirming quality is key to buying a quality vintage briefcase. Be sure to buy only from respected sellers who boast high ratings. Once a briefcase has been chosen, look over the return policy, shipping and handling terms, and payment method.